No matter what time of the day it is, these tulips will always make you feel refreshed and joyful! That’s what they’re born for. 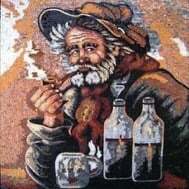 PROs: Handmade mosaic art composed of high-end glass tiles that is guaranteed to transform your space. Mosaicist: Haith D.
CONs: You might feel refreshed too often.